GHS Guitar Boomers Round wound Eclectic Guitar Strings Light GBL 10 pack (10-46) - 6-string electric set: 010-013-017-DY26-DY36-DY46 (10 sets). 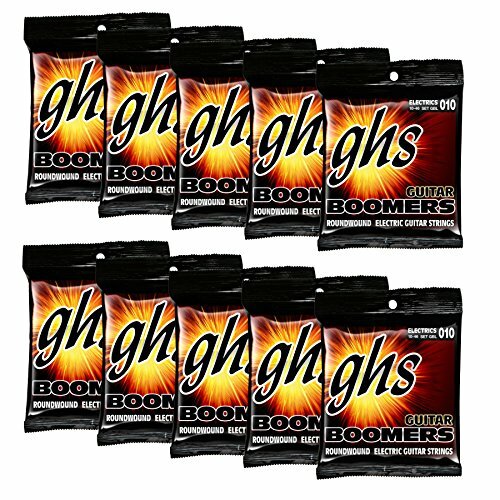 From 1964 to now, the GHS Boomers series has been the flagship set of GHS Strings. Used by musicians in every genre, the Boomers have shown to stand up to any playing style. Now known as "The Power String", GHS Boomers continue to make their mark on music across the world. The round wound guitar set is made with Nickel-Plated steel wrapped tightly around a round core wire. The combination provides the string with its bright characteristic and long-lasting tone. Introducing our brand new Nitro Pack singles! Each single string is sealed in a nitrogen environment, eliminating all oxygen, in a tear-resistant package. Whether you use one string or the whole set, the Nitro-Pack guarantees straight from the factory freshness! ABOUT GHS STRINGS - GHS Strings are manufactured in a state-of-the-art, climate controlled facility using precision equipment and only the purest of materials. The air-tight Fresh Pack locks in factory freshness that endures the test of time and locks out corrosion. When you buy GHS strings you get quality, consistency, lasting intonation and superbly harmonious sound! GHS Strings - The String Specialists since 1964.GBL 10 Pack Set: 010-013-017-DY26-DY36-DY46 (10 sets). Featuring the air-tight Fresh Pack & Nitro Pack singles, guaranteed fresh from the factory! If you have any questions about this product by GHS Strings, contact us by completing and submitting the form below. If you are looking for a specif part number, please include it with your message.